Please tell me someone is keeping an eye on Eddie Vedder. I don't want the guy on a plane, in a car, or near anything sharp. ...he's all we have left. 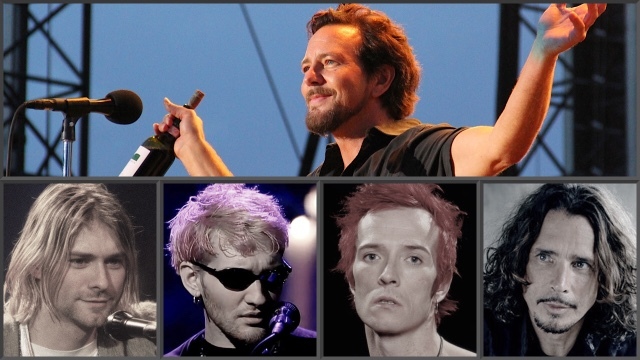 There were 5 distinct voices that created grunge rock. They created a new genre. They sang about what we were going through. They were the voice of the group of kids that were half Gen-X and not quite Millennial. Their music spoke to us in raspy, guttural west-coast accents and we listened. Their sounds were distorted, but the message was clear. Soundgarden, Nirvana, Alice In Chains, STP, and Pearl Jam. These bands were the last real rock bands. They had melody, rhythm, guitar solos, and vocal harmony. They were sad but beautiful, angst-ridden but deeply moving. They were inspired by classic rock sounds and structures but full of new ideas. I told my Dad in 1992 that one day you'll hear Pearl Jam and Nirvana on classic rock radio stations. The passing of Chris Cornell marks the 4th legendary grunge vocalist to leave this world #TooSoon. Perhaps we should've seen it coming with songs like "Pretty Noose," "Like Suicide," and "Blow Up the Outside World," but art can come from dark places. Cornell literally wore a noose in a music video for his last solo album. A clearer cry for help could not be possible. Kurt Cobain of Nirvana was the first in 1994 at 27 years of age. He was on top of the world and fans were devastated. The official cause of death is suicide but Unsolved Mysteries and Private Eye Tom Grant believe otherwise. The second was Layne Staley of Alice In Chains in 2002 at the age of 34. Band mate Sean Kinney described his death as the "longest suicide" he'd ever seen. The last 4 years of his life were spent reclusively with heavy drug use. Our third loss was Scott Weiland of the Stone Temple Pilots in 2015 at age 48. He had a record of drug use and arrests, but seemed to be doing better. He had just put out a new solo record called Blaster, added vocals to a new band called Art of Anarchy, and then died on tour from a combination of cocaine and prescription drugs. Chris Cornell was as popular as ever. His latest solo album was a reflective and grown up collection of mostly-acoustic songs about life and love. He had gotten sober in 2002, and said that during the Soundgarden reunion tours the Jack Daniels and beer bottles were "just not there." The band was headlining every major festival this summer. Then he commits suicide at the age of 52, leaving behind a wife and three children. There's something about creative people. Perhaps they are more sensitive than the rest of us. They have the ability to capture the raw feelings most of us feel and put them into words. They experience all of life, the highs and lows. These guys sang with power and heart and you can feel what they are feeling when you listen. Apparently their talent comes at a personal cost. I think Robin Williams would agree. Some say it's just music. They're just people. ...but there's so much more to it than that. These people created something that means the world to us. These songs were there for us during our worst day, our best day, our first kiss... and everything in between. They're an old friend. Now they're gone. Eddie Vedder of Pearl Jam is the only grunge rocker left. He seems to be in good health. Let's hope it stays that way. Our parents' generation still has Paul McCartney. They still have all of The Rolling Stones, somehow. They still have Frampton. The closest they could get to understanding how the grunge generation feels right now is probably John Lennon, who died in 1980 at the age of 40. You cannot help but feel like a piece of your own life has been extinguished. We will never know what the next song might have been. In my collection, I have all of Cornell's solo albums, Soundgarden, Temple of the Dog, Audioslave, and dozens of songs he contributed to with other artists. I'm gonna play each of these songs all the way through and enjoy the heart and soul he poured into every note... and hope not to do the same for Pearl Jam anytime soon. what about Andy Wood from Mother Love Bone?